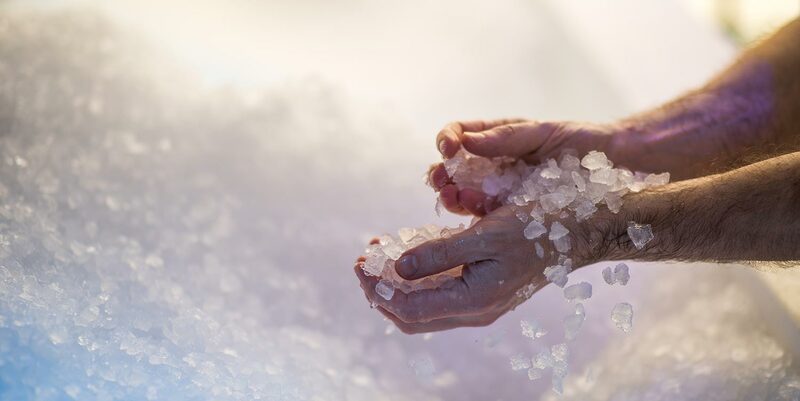 Thermae Bath Spa is built around the city's natural hot springs to create a true spa, in the original sense of the word. The heritage of the site, and the way that the spa makes the most of the waters is outstanding. No wonder there are sometimes queues around the block; go early or late to make the most of this unique spa, as it can get busy. The two separate spa buildings house the Cross Bath where the natural spring rises to the surface, and the New Royal Bath, where you can find the modern pools and thermal facilities. Many of the treatments make use of the natural thermal waters, and both the spa days and treatments are pleasingly affordable. Don't miss the dramatic rooftop pool; swim while looking out across the city to the hills. 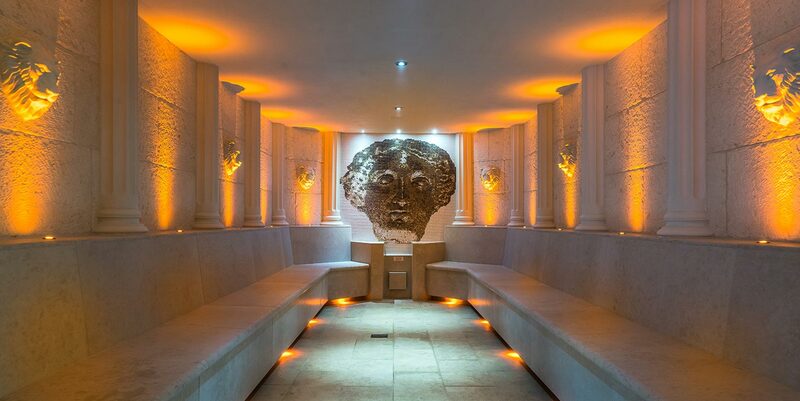 Thermae Bath Spa is tucked away in a cobbled courtyard behind Bath's high street. The main New Royal Bath is a columned neo-classical Georgian building with a contemporary glass-fronted entrance and -- rising from historic houses next door -- a glass cube housing the Wellness suite and rooftop pool. A beautiful, clever piece of design, it elegantly blends ancient and modern while still retaining the feel of a public bath (rather than a swanky spa). At reception, staff will give you a robe, towel, flip-flops and an electronic wrist-band which you can use to access the lockers. Shuffle through the turnstile and head upstairs to the unisex changing rooms. Lockers and shower cubicles have bottle-green glass doors; the changing cubicles open either side via a switch. Oddly, showers are downstairs, which is a bit of a faff; each contained unbranded shampoo/conditioner and shower gel. Toilets are on most of the building's four floors. There's a spin-dryer for wet swimsuits and plastic bags to transport them home in, while a small vanity bar with mirrors and two hairdryers can be found on the way out. Most visitors (us included) head straight up to the rooftop pool; leave your robe on a wire shelf and join the happy throng. Gaze over the golden rooftops and spires of Bath in the warm, steamy waters fed by the city's three springs. Timed jets around the pool's edge allow you to gently bubble away. Built in 2017, the Wellness Suite is on the second floor. 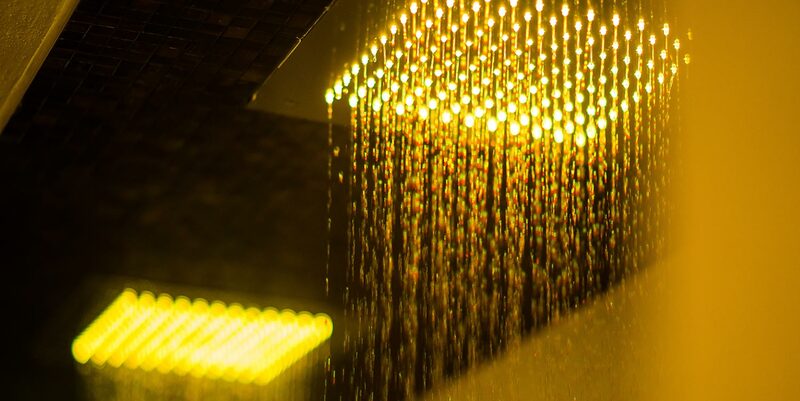 Begin with a walk-through Experience Shower with its body jets and overhead rain shower, then work your way through the four, glass-fronted thermal rooms, each with coloured lighting, and large enough to seat 15-20 people. The Roman Steam Room was thick with fragrant, hot steam on our visit -- we could barely make out the hand-crafted stone seats, never mind the Celtic fresco and columns around the edges. The Georgian Steam Room was equally hot and steamy. We loved the Infra-Red Sauna with its heat panels to warm your spine. 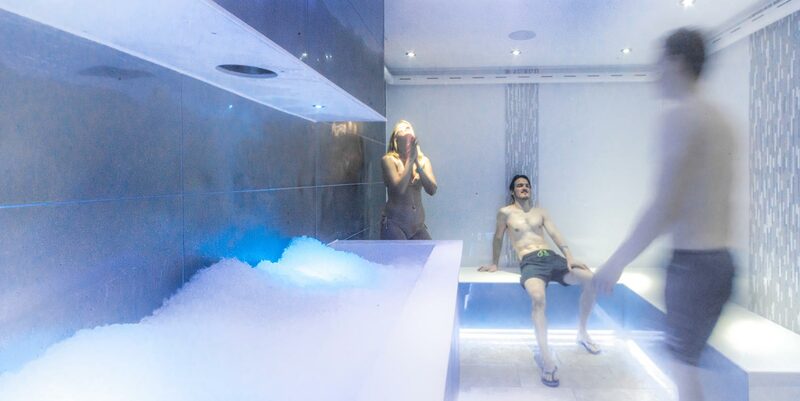 Cool down afterwards in the blue, misty Ice Chamber with its metal-panelled walls and a huge tub full of ice. 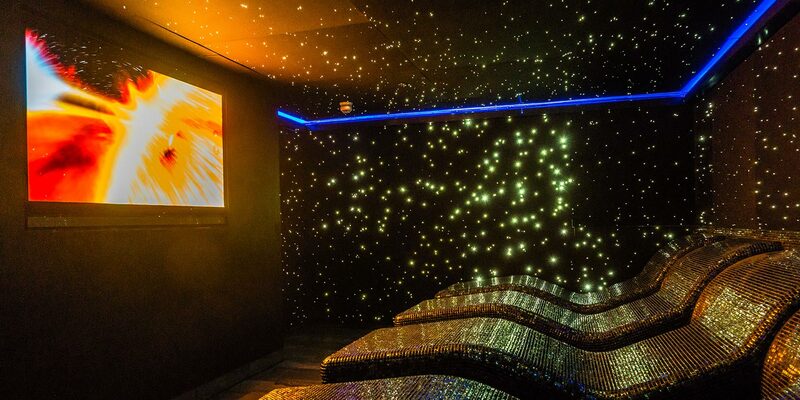 After rinsing off in one of three showers, chill out in the dark, atmospheric Celestial Relaxation Room: lie back on heated tepidarium beds and gaze at the twinkling ceiling. The New Royal Bath's second pool is the large, curvaceous thermal Minerva Bath on the ground floor, which was lightly refurbished in 2018. Glass walls let natural light flood in, while four space-age white columns support the ceiling. Step into the warm waters and enjoy massage-jet stations, a central whirlpool and a meandering river. There are loungers around the edge for taking respite from the water. On this level, you can also find the small Hot Bath which has light spilling through a glass ceiling. This serene pool is used for Watsu treatments. Quiet relaxation spaces can be found in each of the three treatment areas; help yourself to water, tea, magazines and blankets, and relax on a lounger. There is also an outdoor terrace near the Wellness Suite with rattan armchairs and sofas. Want more of an exclusive experience? Book a private slot at the Cross Bath opposite, a romantic 18th-century open-air bathing pool fed by its own spring. We tried the Georgian Rose Trilogy (60 minutes, £99), one of Thermae's signature treatments using Aromatherapy Associates' Rose Renewing products. My therapist, Winnie, collected me from the Hot Bath reception and led me to my treatment room, which was softly lit with soaring ceilings. Winnie left me to settle on the massage bed, then returned and cleansed my feet with hot towels. She began the treatment with a brisk, stimulating body brush. Winnie then drizzled warm peppermint-scented oil onto each of my legs, adding a scoop of exfoliating scrub that incorporated sea salt and coffee extract. She repeated the process on my back and arms, before rolling me over to do the same across the front of my body. After a quick shower, I was back on the bed. Winnie massaged in the hydrating body gel, followed by a body oil. For the facial, Winnie began with a gently purifying cleanser. She applied a pore-refining exfoliant with a paintbrush and removed it with a warm cloth. Winnie then smoothed on the rose face mask but, as I felt quite a powerful tingle, removed and replaced it with the soothing mask; a better choice for my tantrum-throwing skin. As the mask set, Winnie gave me a relaxing head, neck and shoulder massage. The treatment finished with an enriching serum and moisturiser. I emerged feeling relaxed and ready to tackle the hustle and bustle of the spa, with soft, glowing skin. Thermae Bath Spa also offers Roman and Georgian rituals with Aromatherapy Associates, a wide range of massages including aromatherapy and reflexology, hot stones, bamboo treatments, scrubs, facials, a Vichy shower experience, Watsu and a Kraxton Stove hay chamber. There are also treatments for couples, men and mums-to-be on the treatment menu. Food is served in the bright Springs Café, with its large windows overlooking the street. The menu features a variety of hot main courses, such as braised hake fillet with hazelnut crumb or garlic and mushroom rigatoni, as well as a selection of sandwiches and plenty of desserts to satisfy a sweet tooth. Dietary requirements can also be catered for. We went for the soup of the day, warming spiced cauliflower with a side of toasted bread. The friendly smiles and helpfulness of the spa staff. The many ways Thermae Bath Spa pays homage to its origins, such as the mosaic murals in the Wellness Suite. The changing rooms and toilet areas are showing their age, particularly given the refreshed feel of the Wellness Suite and the Minerva Bath. Groups of friends looking for some jovial spa time will enjoy Thermae's lively atmosphere. We noticed lots of couples, and plenty of tourists visiting this landmark spa, too. 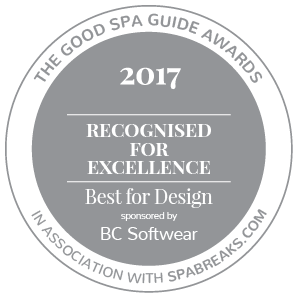 We gave Thermae Bath Spa a Good Spa Guide Rating of 4 Bubbles. This sprawling spa packs a punch for excellent facilities in a central location. While some areas could do with some sprucing up, and it's a busy spa, Thermae Bath Spa offers a good range of relaxing treatments and a buzzy ambience. Spirited Spy visited in February 2018 and awarded it 4 Bubbles. "Hi there, Myself and my fiance are getting married and we would like to spend our little honeymoon for x1 or x2 nights at your hotel! We would love to know what would be the best deal and room you can offer us please? We are looking at spending a night from Thurs 22nd August - Friday 23rd August ? Many thanks! Surmila "
"birthday gift for a boyfriend ." "Just back from a trip to Bath to visit this spa today. Was shocked to find that they give every visitor a pair of plastic flip flops on entry which are not re-used by the spa and go into the bin and therefore landfill. " Springs Café offers a ‘grazing menu’ of light bites and a selection of sweet treats.